The Viva Fresh Expo is taking a new approach for the second annual Gateway to Innovation Awards by expanding its submissions to all types of innovations from the fast-growing, Tex-Mex corridor. In addition to packaging designs and new point-of-sale developments, industry members are encouraged to submit a wide variety of innovations included but not limited to new seed varieties, advances in production, machinery, packing facilities and greenhouses; technology or application software, food safety, traceability, sustainability efforts and more. The contest is open to all Viva Fresh exhibitors and sponsors. 24 finalists will be selected to be included in the display case by a panel of judges comprised of retail, foodservice, and produce industry veterans based on a set of strict criteria. All expo attendees will be encouraged to vote live, from the show floor via mobile device, for their favorite innovation to receive the Best of Show Award during the Expo. Applicants may submit their entries at the official application webpage: www.vivafreshexpo.com/viva-fresh-gateway-to-innovation-awards. All applications are due by February 20 and the finalists will be notified by March 25. The finalists will be displayed before and during the Expo on Saturday, April 27 and the overall Best in Show Award will be announced that afternoon, during the show. 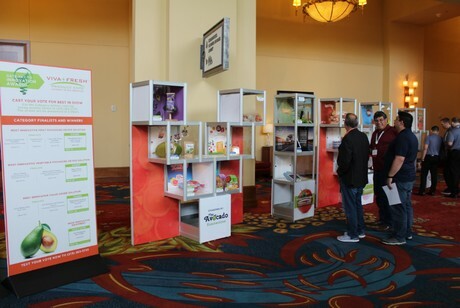 The 2019 Viva Fresh Expo will be held on April 25-27 at the JW Marriott Hill Country Resort in San Antonio, Texas.